Two weeks ago in one of our "things in progress" post, there was mention of a coffee table that I was bending some sweet legs for. Remember that? Remember thinking to yourself, "Man, I wish I could see more about that awesome looking coffee table!" Well, folks, wish no more. Since we completed the first ever Larissa-and-Rob collaboration in the form of a coffee table last year, we have been eager to make another. [Cue the awesome and beloved Cosgriffs] Lucky for us, we got a commission for one! And, since we're at it again, we might as well make one more for spec purposes, right? "Spec purposes" meaning of course that Rob and I just want to see what an all-walnut version of this bad boy will look like. The low down: Just like the first, these will sport bent lamination legs, a long slatted lower shelf, and a top composed of framing with captured veneer panels floating in the middle. I have been tackling the bases while Rob works his veneer magic on the tops. First, I made two beefy plywood forms to bend the wedge-shaped thin layers of wood between. The forms have seen many stages of improvement since our last table. You can see in the video that these guys have maple guides mounted to either side to keep the layers of the lamination from shifting out of the form as the clamps are tightened. You can also see that Gorilla Glue makes one hell of a foamy mess. 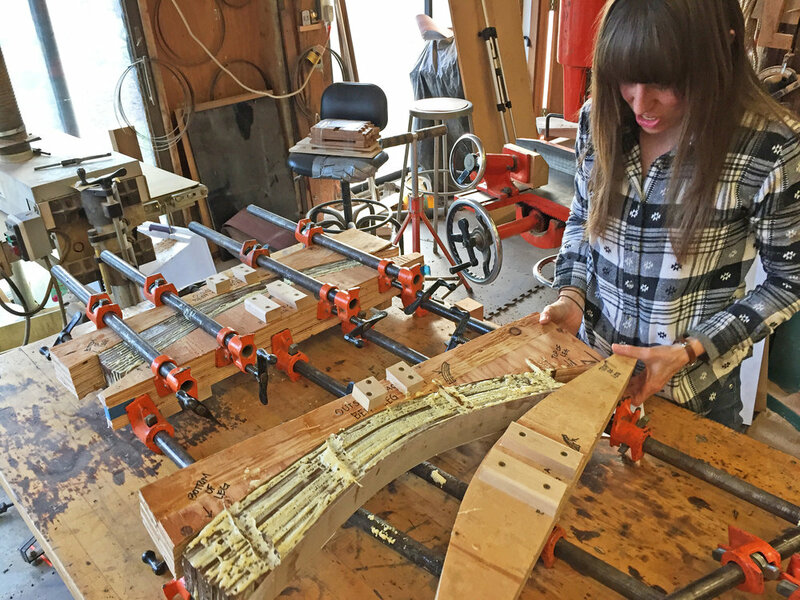 Although it requires a few additional steps, like dampening each bit of wood before applying the glue and dealing with a sea of foam, polyurethane glue is best for bent laminations because it doesn't allow for "creep" as the layers of wood expand and contract over time. The legs were broken free from their forms the following day (and the process was repeated for the remaining 6 legs). 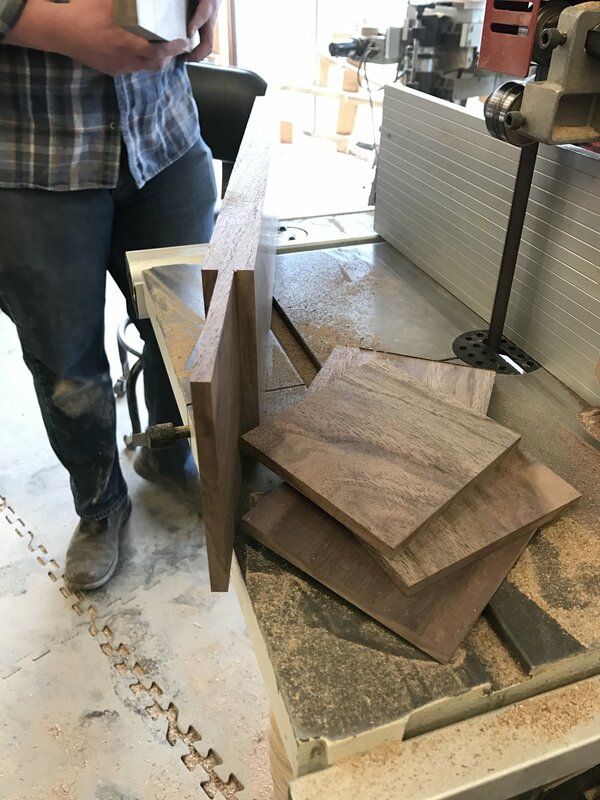 After a few hours of scraping, the legs were sent through the jointer and planer to smooth them out and allow us to finally see the fruits of our labor. The problem solving really set in when we had to figure out how to cross cut these suckers to the correct length while ensuring that the top and bottom cuts were parallel. Over the length of a curve? This is some calculus level stuff. There was talk of affixing two legs at a time to a carrying board made of plywood that would allow us to cross cut against the fence of the table saw and trim off the length we needed. Good idea- the problem came when these 2 5/8" legs were already pushing the boundaries of the height of our table saw blades, so to add plywood underneath would mean it couldn't possibly cut all the way through in one cut. The careful layout that would be required and added steps of having to flip the legs for a second pass to remove the portion that was missed had us dreaming up new solutions. The current method under trial is using a large square of MDF cut to the proper length (mounted to one leg at a time with double face tape) that provides reliably parallel, straight edges for a router with a long pattern copying bit to ride against to cut the ends flush with the template. One leg down so far... 7 more to go. 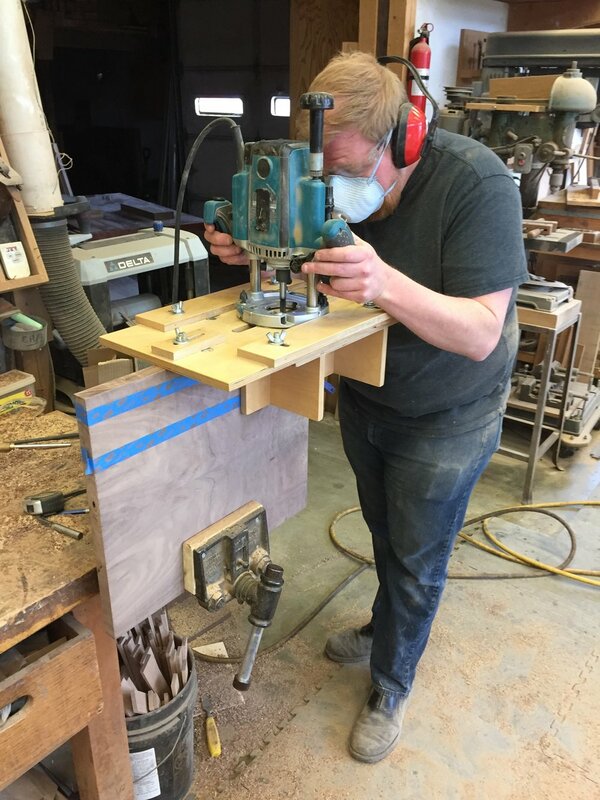 When the bridle joints were fitted, he was on to laying out and then routing out the mortises to accept the floating tenons that hold the veneered panels in place. 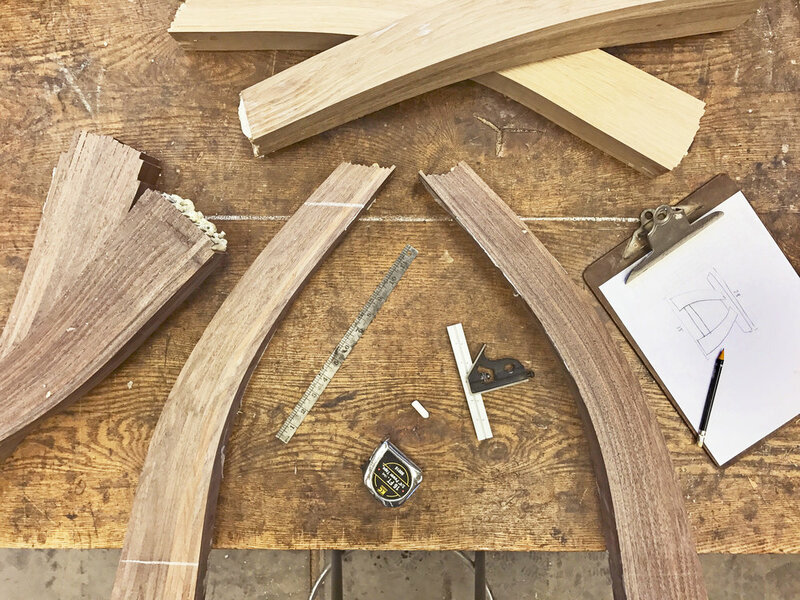 The jig he used to cut those mortises is something we use in our Advanced Joinery course so, if you're curious about it, you should probably come take some classes with us. Just sayin'. It's a contraption we use quite often to rout into the edges of things. It carries the plunge router perfectly straight and parallel and can be adjusted to clamp and center onto any thickness. It can also be adjusted to rout slots of desired lengths. In this case, he set it for the proper length and centered on the thickness consistent for each part of the table top and then just moved the jig around to cut the same sized and placed mortise in each of the 44 locations. It was critical that each of the mortises was perfectly placed to match up with it's opposing mortise so that the tenons fit just so into both parts. Forty-four mortises later, everything fit together just as planned. What a pro. And, that is where we find ourselves on this Friday afternoon. With just an hour left in our work day, I will retire from typing and pick up the router to try and knock out a leg or two more before the weekend sets in. Happy Friday, readers! I wish you a safe, fun, and sawdusty weekend!